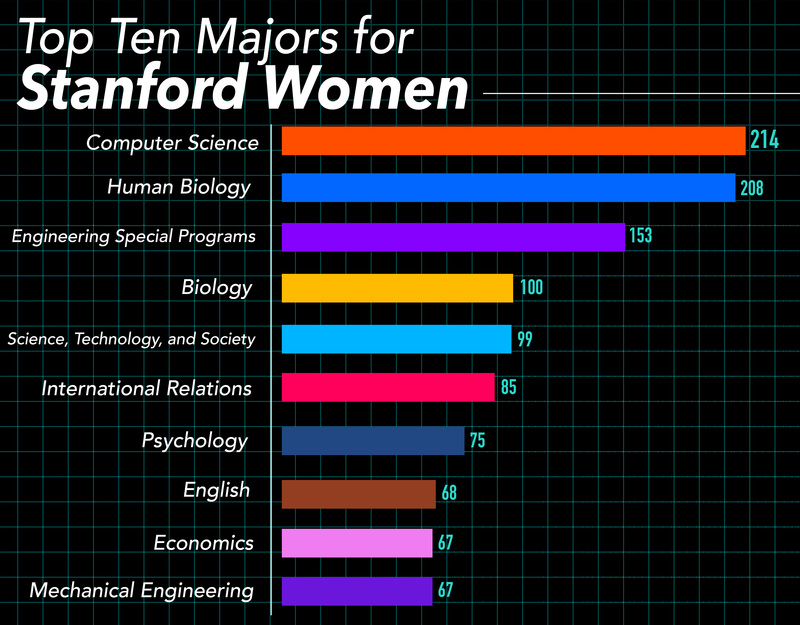 Computer science has now become the most popular major for female undergraduates (MISO KIM/The Stanford Daily). As of last week, computer science (CS) has become the most popular major on campus among women. According to data on declarations, 214 women are majoring in computer science, a fact that solidifies the recent growth of interest in the department. The previously most popular major among women, human biology, closely trails with 208 declarations. 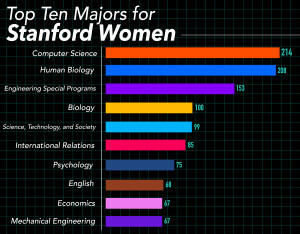 Although women comprise just 30 percent of computer science majors at Stanford, that figure is ahead of the national curve — in aggregate, women earn about 18 percent of undergraduate degrees in computer science in the nation. While significant work remains before the computer science program reaches equal gender representation, professor of computer science Eric Roberts finds this milestone important nonetheless. Roberts explained that increasing women’s numbers in CS could alleviate their sense of isolation in the field and help fight off the effects of the imposter syndrome. Imposter syndrome is a term used to describe people who have trouble internalizing their accomplishments and who tend to attribute achievements to luck. The syndrome is known to affect young women pursuing engineering fields, and computer science lecturer Marty Stepp emphasized that an inability to identify with peers can aggravate the imposter syndrome. Stepp believes that a more concerted effort to introduce young women and men to CS earlier on in their education could go even further to help. When students arrive at Stanford hoping to get started in computer science without prior experience, Stepp notes, they have an expectation that the student next to them has been programming since middle school. “That gap is very intimidating – whether it’s real or perceived,” Stepp said. Kat Gregory ’15, a computer science major who came to Stanford intending to study human biology, credited the department for being welcoming and for introducing computer science as something simply fun. Gregory is now a section leader herself. Meeting different kinds of people who shattered the computer science stereotype in her mind and with whom she could identify, Gregory explained, encouraged her to take a leap to explore her own interests within the subject. Roberts, however, also spoke about how growth of the computer science major has begun to tax the department’s resources. Finding large classrooms, teaching assistants, section leaders and office hour space is difficult for the department in its current state. He also stated that departmental resources would need to grow in order to accommodate the expected increase in students. Contact Susannah Meyer at smeyer7 ‘at’ stanford.edu.